Mindy's fitness Journey: So Happy to #MeetMaxwell! And Giveaway winner! Have you had the chance to #MeetMaxwell? Yes, I had a chance to meet Maxwell Health a few weeks ago. I am so glad that my friend Shannon at Badass Fitness referred them to me. 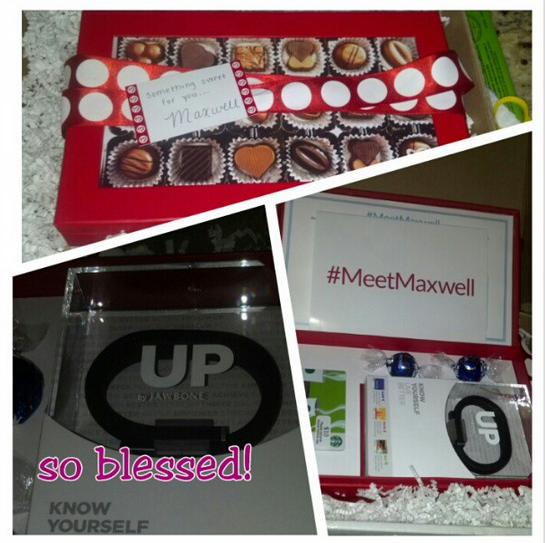 When I opened a beautiful package the day before Valentine's Day, I had no idea who or what Maxwell Health was. I did some research about Maxwell Health and found some things that we have in common. I think health insurance should be about HEALTH... Duh! It seems to me that if I am investing time and money into my health and fitness, that shows that I am invested in my future. Maxwell Health notices these things. Maxwell Health rewards people for being healthy. It's long overdue that we have a health insurance that rewards us for health rather than a sick insurance that we only use for sickness. Imagine an insurance that sends Starbucks cards to say nice work on your half marathon or great job going to the gym regularly. We are entering uncharted waters with the new health care system that has been set up for our government. It's time to start making important decisions that will help you in the long run literally and figuratively! This package from Maxwell Health contained a jawbone to track my calories burned, my sleep patterns, my caloric intake (if I choose to enter my food) and my steps. It also contained 2 dark chocolates, a Starbucks gift card and a letter telling me to #meetmaxwell. Maxwell Health is an independent company that works with multiple insurance providers to offer the best health and dental benefits for you and your family. Our advisors provide unbiased recommendations based solely on your family's needs. Though Maxwell Health generates revenue by advising on the purchase of insurance, our advisors are not incentivized to recommend one plan over another. Your happiness is what matters most to us. Maxwell Health only works with insurers and offers plans that are highly rated by U.S. News & World Report, A.M. Best, and the NCQA. Our priority is to make sure you are adequately covered based on your family's needs. Not all insurance is created equal, and our job is to help you find insurance that will protect you. I have loved using my jawbone, and I can't wait to learn more about Maxwell! Have you been lucky enough to #MeetMaxwell. I have and it has been a pleasure to meet you! Congrats to Keri R. for winning the 90-day FitnessGlo membership! I agree, health insurance should be about HEALTH! Not just treating when something goes wrong. I have never heard of this. I'll have to look into it! Hi Mindy. I am just getting exposed to Maxwell, through Shannon as well as the fact that I met someone during a business meeting on Thursday who had one. He hooked it up to his iPhone and showed me all about his activity and sleep stuff!!! Insurance cos are definitely wise to reward enrollees for doing stuff that keeps them healthy! What a cool product and great idea!! I've long thought that insurance companies should reward customers who are living an active, healthy lifestyle. What an awesome idea! I have been drooling over the Jawbones since Kat from Sneakers and Fingerpaints introduced me to them this morning! I want one! I am blessed to have the best insurance ever through my work and they do give us gift cards now and then for things like getting screenings done or filling out surveys, but the idea of getting a gift from your insurance for doing a half marathon ROCKS! Sounds like a great idea! I recall that a company I used to work for would give $50 to anyone who quit smoking. Yes, it was a great incentive for those who smoked, but I always wondered why those of us staying healthy didn't get an incentive for doing so. I want to try this out. What would be the ultimate gift to get from your insurance company? I would ask for a Garmin and entry to 2 1/2 marathons.